Georgioupolis Crete Γεωργιούπολης is a small seaside village with a long sandy beach on the north coast of Chania, Crete. The village sits at the estuary of two rivers flowing from the Lefka Ori or White Mountains, nestled in the corner of a bay with the Cape Drapano to the west and wide open beaches to the east. This village is known for its long avenue of tall eucalyptus trees upon entry, its pretty harbour and rivers, its wide sandy beach and beautiful, white, seaside chapel. Georgioupolis is 42 km from Chania town and 22 km from Rethymnon town. Drive east from Chania along the national road A90 for 38 km then turn off, the village is 4 km from the national road. From Rethymnon drive 18 km west along the national road and turn off, then it is a further 4 km to the village. Public transport is via KTEL buses from both towns to. From Rethymnon the trip duration is just under 30 minutes and cost is around €4.50. From Chania the trip duration is 30 minutes and the cost is €4.50. Services are frequent because the beach lies not far from the national road, so most of the regular buses travelling between the major cities also stop at Georgioupolis. Taxi transfers are also available, costing approx. €62 from Chania Airport and 50 from Chania Town. The village sits directly on Georgioupolis Beach (above), which some measure to be 9 km long. It is located between the rivers Almiros and Perastikos. It is a wide beach with some resorts built on the dunes, with plenty of wide open spaces. 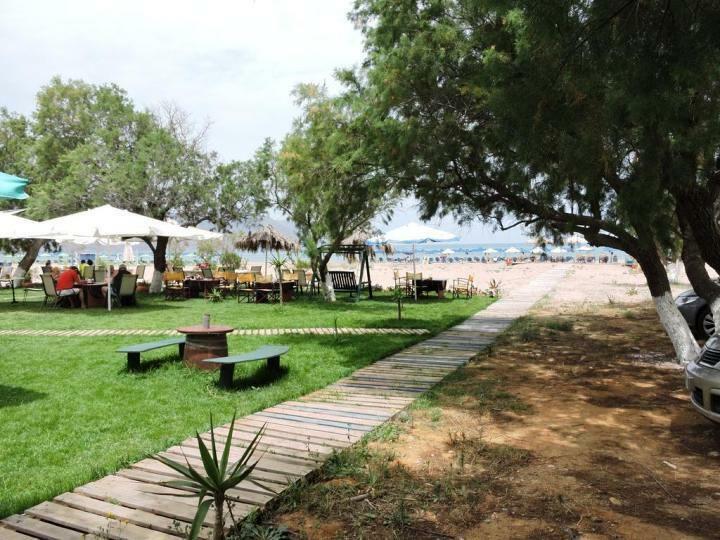 In summer rent umbrellas and sun lounges, eat at cafes and tavernas right by the beach, and enjoy the bars. Close by across the river is Kalyvaki Beach (below), and to the east Kournas Beach, inland lies Kournas Lake and rolling hills of olive groves. Further to the east again, at the border of the Chania Region with Rethymon Region, is Kavros Beach. 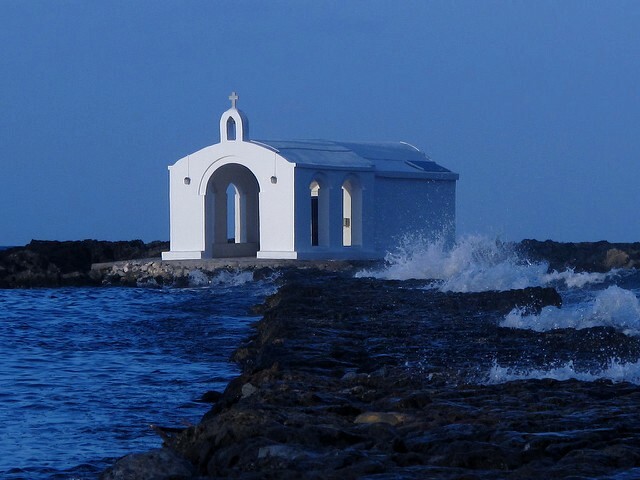 Άγιος Νικόλαος is the patron saint of sailors and this chapel’s location on a tiny islet at the mouth of the fishing village is appropriate to bless the fishermen and their boats as they depart for their morning of fishing. The narrow rocky causeway to get to the church is a lovely, yet rough walk, you may notice wobbly stones and crabs scrambling on the rocks and sea birds or Kingfishers. As the walkway and the islet are at sea level, it is best to take this walk at low tide in good weather. There are beautiful views back towards the village and the peninsula, the mountains and the sea all around. This is a must for photographers! Some hours could be enjoyed getting the perfect image. Weddings are sometimes held here or photo shoots for weddings, which are fun to watch. Don’t forget to light a candle and make a wish, say a prayer and make a donation. A simply beautiful, characteristic and spiritual experience in Crete. One of the greatest pleasures in Greece is dining with your feet in the sand or directly on the beach, or next to the water. This you will be able to experience in Georgioupolis, and a whole lot more. Next to the beach are Corissia Park, the Cotton Club, Summertime and the Deep Blue Sea. A little inland be assured of great food at traditional seafood taverna Poseidon. For a drink before dinner head to the bar at GB Rooftop Food Lounge (a play on the Grande Britagne in Athens - pictured above), great modern place with an uninterrupted view to the chapel, part of the Georgioupolis Beach Hotel. Walk across the river to Arkadi Fish Taverna for lovely views over the water to the chapel or Kalivaki Taverna on the cool terrace right next to the beach. 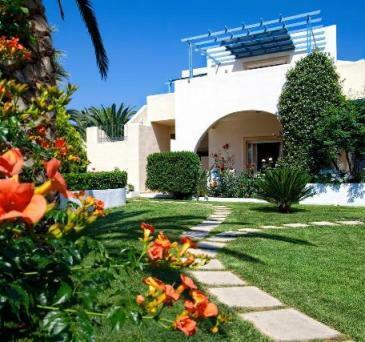 Poseidon Studios are small, right on the beach and very good value. Enjoy complete access to the beach. With only 11 rooms and its own bar-cafe right on the beach, this is a little home-away-from-home. Enjoy your sun lounger, pad back and forth to the water and relaaax. A happy, family-run, local place. Papadakis Apartments are centrally located in the village, handy to shops, tavernas and the beach and harbour, and only 600 m from the bus stop. A beautiful green garden provides tranquility and the spacious rooms are great for self-catering. 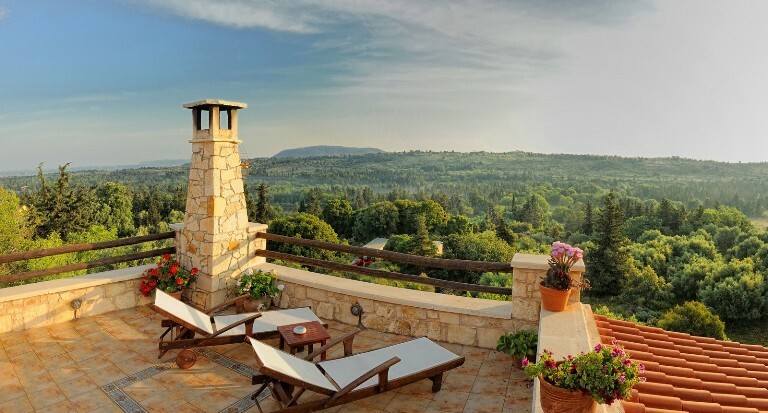 Strofilia Villas (pictured above and below) are located in a lush, green forested region just behind the beaches of Georgioupolis Crete on the Drapano Cape. The silence and authenticity of this beautifully restored village home will take your breath away. Mary, your host, will be there to provide local raki and home-made goodies to make sure you get your breath back! 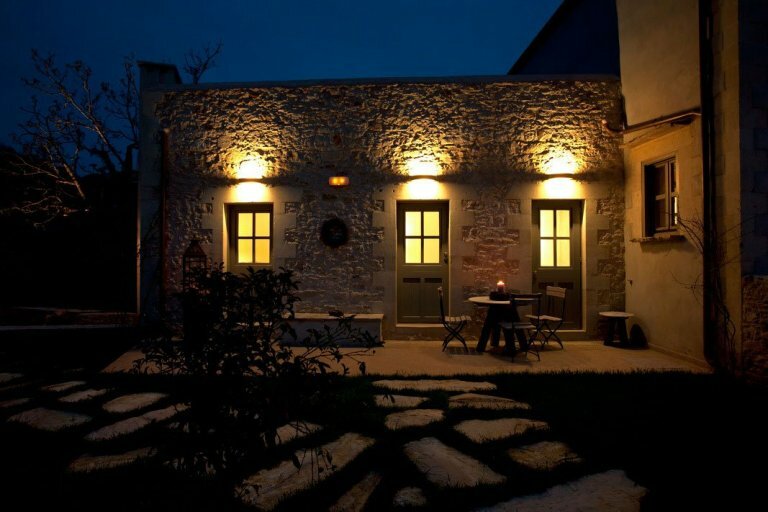 A vehicle is suggested for this accommodation, as you can explore the region, being only 30 km from Chania town. 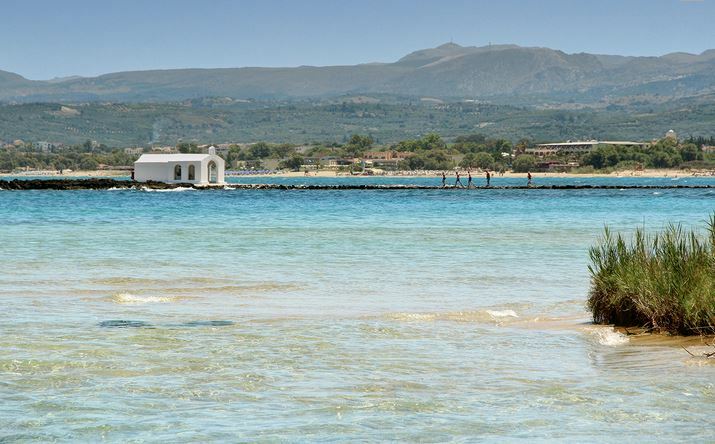 Enjoy your natural peace whilst making Georgioupolis Crete your 'home beach'. A completely private boutique villa in the very best style of Crete awaits you at Villa Athermigo (pictured above and below). 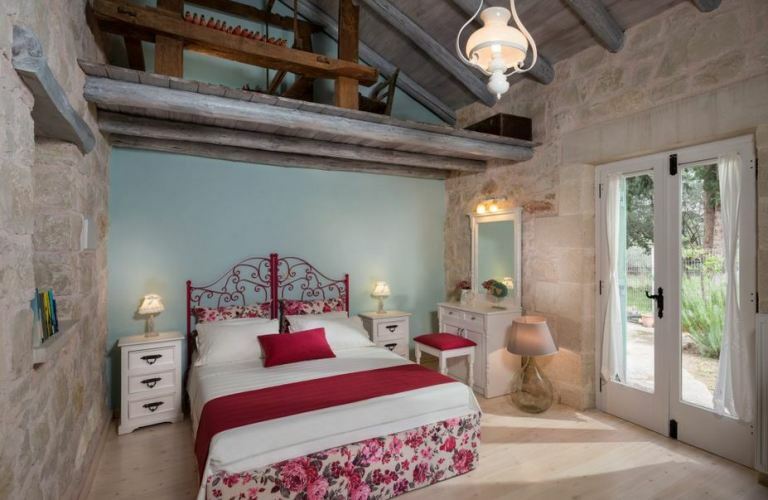 The textures of the walls will captivate your fingertips, the outdoor area is adorned with the old mill stones from the 250 year old olive oil mill that has been restored with meticulous attention to detail. 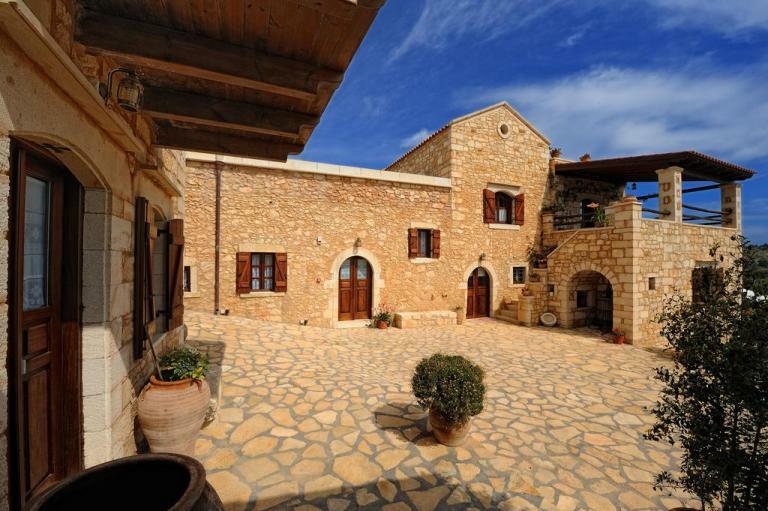 This is a one-of-a-kind property only 13 km from Georgioupolis Crete. 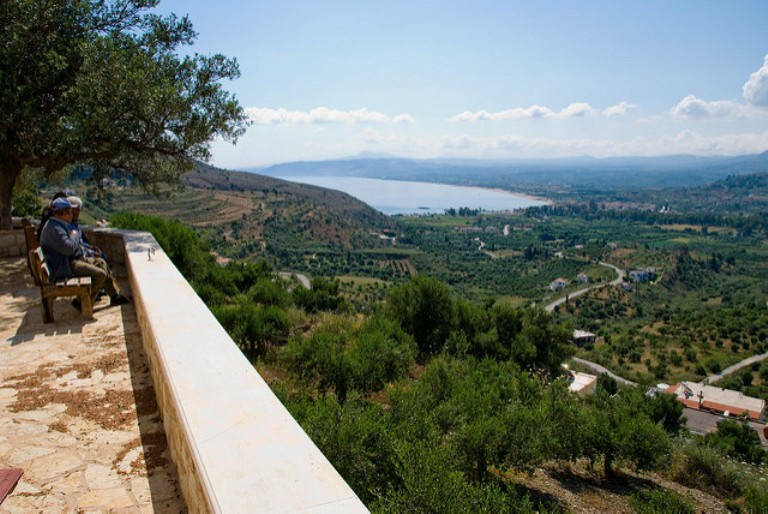 It is ideally placed just outside the village of Gavolochori and only 28 km from Chania town. The beaches of Almyrida on Souda Bay are only 10 km. There are three villas to choose from in this village-like cottage collection. This is truely the best of both worlds - the traditional and the modern. Get the feel for the timeless way of life on Crete yet lack for nothing in comforts. 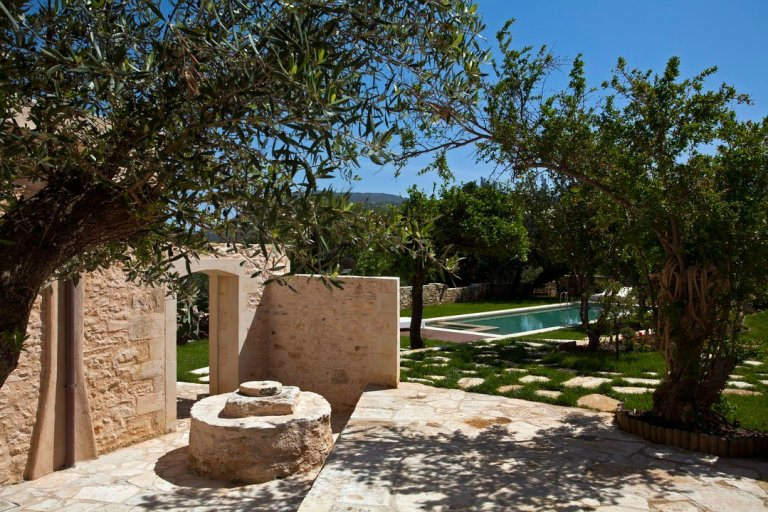 Villa Petra accommodates 6 guests, with 3 bedrooms and 2 bathrooms, a pool and nurturing garden setting. Tucked away in the olive groves in rolling hills at the foot of the mountains, next to the small hamlet of Maza, Apokoronas and the village of Vrysses, this homely villa is only 7 km from Georgioupolis Crete. Especially on a hot summer day it is good to get into the hills and explore the hinterland of Georgioupolis. This area is called Apokoronas and is full of beauty. 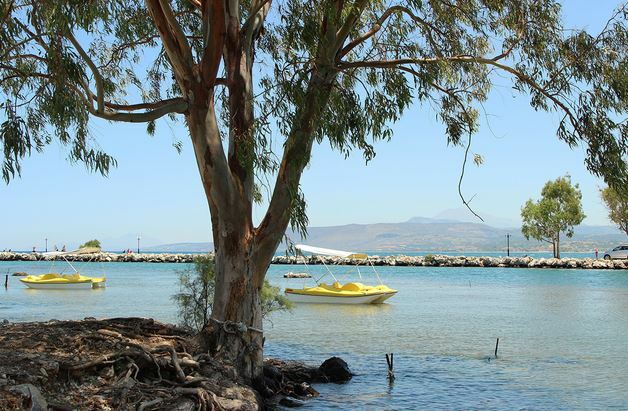 A short 5 km drive will take you to Lake Kournas (below), a large fresh water lake with beaches and lovely, safe swimming. Rent a pedalo and enjoy the scenery, or take a drink at the lake side cafes. 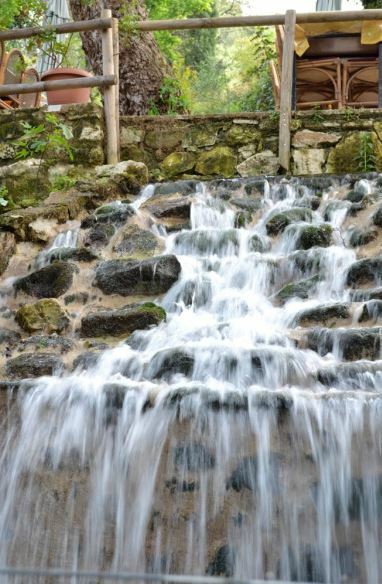 Save your hunger for lunch in the inland village of Kournas or Agiroupolis, a further 22 km of twisting mountain roads and eat in the taverna under spreading plane trees surrounded by rushing waterfalls (pictured above).